The Story of the Most Ubiquitous Riff Since "Satisfaction"
At first blush that statement might appear audacious: how could what amounted to little more than an indie-rock anthem possibly be mentioned in the same breath as the Big Bang of teenage culture and, possibly, of modern rock ‘n roll itself? But upon closer inspection, it’s not audacious enough. As the go-to sports anthem internationally, it’s very likely that “Seven Nation Army” may not only be the best-known musical phrase in popular music, but also the last Great American Folk Song. This argument poses two counter-intuitive narratives: first, that the traditional understanding of a folk song has become anachronistic to the point of stereotype, and second, that the sports anthem—a genre most associated with the daft, soulless and unabashedly commercial aspects of songwriting (i.e. Jock Jams)—is the last remaining musical monoculture. It’s logical then that so-called “topical” folk would stay regionally minded, leaving a gap for the “old school” broadly applicable type that traverses international borders orally, reaching beyond socio-economic and geographical restriction. The only vessel for such things nowadays is the sports anthem. A former seminary student, White has argued that the sports arena is an extension the church gathering, where many of the songs we consider folk canon first took shape. “Modern folk music around the world happens when groups of people gather together in larger numbers, not in small homes and villages like it used to in the past. And many times this will happen in sports arenas of course, particularly soccer,” he told the Detroit Free Press in 2016 on the occasion of “Seven Nation Army” being ranked No. 6 in a poll of Detroit’s 100 Greatest Songs. 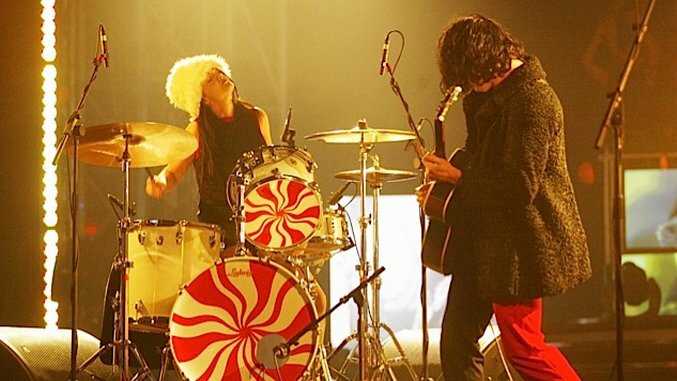 “Seven Nation Army” kicks off the White Stripes’ fourth and breakthrough album, Elephant. Prior to that, White had spent the majority of his adult life piloting the garage rock duo out of Detroit’s nascent bowling-alley rock scene, nimbly blending high-art conceptuality with a childlike sensibility and snake oil salesmanship. “We don’t think we’re going to play arenas; we don’t write songs that are going to be Top 40 hits,” he had told a Dutch film crew in 2001. Just two years later, White had decided such ambition was possible and that the opening number, with its thick, ersatz bass and stomping rhythm would be its calling card, insisting that it be the first single despite label protest. And, indeed, almost instantly upon its release in March of 2003, “Seven Nation Army” served as a touchstone for its author, earning the White Stripes a Grammy for Best Rock Recording while helping land the group its first American Top 10 album. But it would take another seven months, on the eve of Oct. 23 to be exact, for the track to begin its unstoppable conversion into something much, much greater. It’s somewhat ironic that Jack White—a majordomo of obscure folk songs—unwittingly crafted his own on the world’s biggest stage. From an early age, White (born John Gillis, the youngest of 10 children, and seventh son) obsessed with the concept of folk music, crafting a persona and a musical palette from the playbook of the genre’s masters. So it’s unlikely the young Gillis dreamed the true legend of Jack White—if in historical importance, not in name—would begin to take shape in a dark, drunken gathering of supporters for the European soccer club Club Brugge K.V. That October evening, the Belgian football club was set to take on Italian powerhouse A.C. Milan in the group-stage of the UEFA Champions League. While pre-drinking at a local bar, K.V.’s supporters, known affectionately as the Blue Army, took a shine to a song on the bar’s stereo—a simple riff they could chant while intoxicated, unencumbered by English lyrics. They continued the chant through the streets and into the stadium, where, courtesy of Peruvian striker Andres Mendoz’s goal at the 33-minute mark, Brugge would shock Milan, 1-0. Sensing a good thing, the Blue Army carried the chant home. From there, they began chanting it during home games. Eventually, it became the team’s goal anthem, pumped out of the stadium P.A. after every score. It didn’t take long for the song to find its Italian roots, as a spoil by supporters of A.S. Roma following their win over K.V. during the 2006 UEFA Cup. Lacking a strong national connection to the source material, Italians began referring to the catchy riff as the “po po po po” song. And the “po po po po” song was about to blow up. “I am honored that the Italians have adopted this song as their own,” White said at the time. Years later, he reflected a bit more verbosely on the phenomenon. “What thrills me the most is that people are chanting a melody, which separates it from chants like ‘Thank God I’m a Country Boy’ and ‘We Will Rock You’ and many of the most popular songs where large groups tend to clap or sing words and not just notes,” he said. Since 2006, “Seven Nation Army” has been adopted not only as the unofficial anthem of soccer—it was played during every game of the 2008, 2012 and 2016 Euro Cups, and remains a chant song for local and national teams across the continent—but of sports the world over. First crossing over to North America via Penn State’s football program, the riff spread quickly throughout the amateur sporting world on its way to becoming a staple at the majority of stadiums across the whole of professional sports (weirdly taking on a special importance in Baltimore, where it’s the hype song for both the city’s football and baseball teams). Today, it’s safe to say, it’s more noteworthy not to hear it at a pro sports game anywhere in western world. There is no doubt that “Seven Nation Army”’s success (and White’s consequent royalty checks) owes much to luck. After all, it had likely been played to millions of soccer fans without catching on. Soccer fans have countless chants and verses they use to serenade both sides of a match. So what exactly was in the air the nights of those Euro games? It’s hard to say. But given the boost it’s not hard to surmise why it went viral. As White noted to the Detroit Free Press, sports are the only surviving tentpole events that millions of humans congregate around. While pillars of the music and entertainment industry tumble, sports still offer a key, dependable focus for all types of media (live sporting events remain the major reason for cable subscriptions, for example). As an easily adaptable, catchy, short and subject-free riff (unlike “Satisfaction”’s unalienable connection to the ‘60s counterculture as well as the baggage of the Stones and their rapidly aging fanbase), “Seven Nation Army” has become the most popular music on the world’s most popular and wide reaching platform. In sum, the numbers of people who have, mostly unconsciously, adopted that riff into their lives—whether through the games, countless remixes or endless cultural renewals in films, commercials and televised singing competitions—are undoubtedly in the billions. Such is sport’s reach, worldwide. And “Seven Nation Army” is undoubtedly world sport’s modern anthem. For all its peculiarities, however, perhaps the most surprising aspect of “Seven Nation Army”’s musical dominance is the glee it brings its author. As both America’s foremost musical purist, archivist and self-promoter, White spent the majority of his professional life enforcing strict, limiting rules upon himself, and seems like the type of guy who would wear the popularity, perverseness and digital extension of what will inevitably be his most important musical contribution like an albatross around his neck. Yet, when he speaks of the ubiquity and astounding reach of his creation, the former White Stripe seems genuinely pleased if not downright giddy.